In tandem with the role of providing heavy lift access to the ISS, the three major Beyond Earth Orbit (BEO) missions – namely the landings on the Moon, Mars and Near Earth Objects (NEOs) – aren’t the only options available to the Shuttle Derived Heavy Lift Launch Vehicle (SD HLV), as noted in the vehicle’s assessment presentation, which also covered the risk and abort findings. While the political deliberations into the future of NASA continue, the focus remains on an eventual goal of sending a manned mission to Mars, potentially via the moon of Phobos as a precursor mission. Such a goal remains deep into the future, leading to a learning curve of BEO missions, previously noted as an essential element in NASA’s own Flexible Path roadmap approach. Other manned missions, such as a return to the Moon and an opportunity to send an expedition to a NEO (asteroid) are heavily documented, although it was the SD HLV assessment which provided an additional early mission option, which may prove to be highly attractive to engineers, scientists and politicians alike. Solar Power Satellites (SPS) – also know as Space-Based Solar Power (SBSP) – is a system for the collection of solar power in space, for use on Earth. Launching a SPS demonstration mission would provide tests not only for the SPS concept, but also “underscore” the capability of the SD HLV. Such a mission would likely provide an opportunity for the HLV to stretch its legs on an opening operational mission, as soon as 2016, focusing on the delivery of a 30 metric ton demonstrator in Geostationary orbit (GEO). 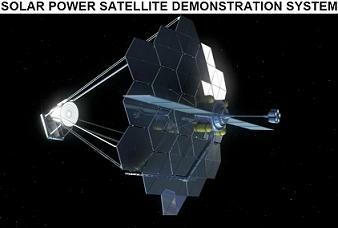 “A prototype Solar Power Satellite mission was examined to underscore the heavy-lift capabilities of the HLV. It involves the deployment of a 30-mt SPS demonstrator in geosynchronous orbit and tests out all of the key transportation and solar power satellite elements. 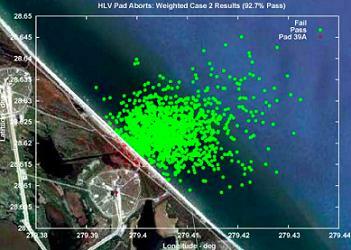 The first SPS demonstration mission could be flown in 2016,” outlined the 726 page SD HLV assessment presentation (L2). Outlining the mission profile, the authors took into account the need to speedily transfer the SPS payload through the high intensity regions of the Van Allen belts, in order to reduce the exposure to damaging radiation. 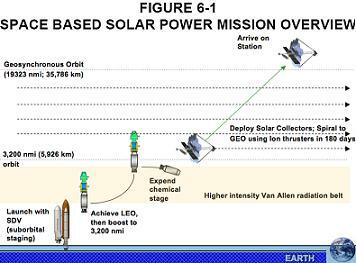 “Figure 6-1 shows the operational scenario that proceeds from this initial orbit that maximizes the Solar Power Satellite mass delivered to geosynchronous orbit. The Earth Departure Stage is used not only to attain low-Earth orbit (HLV suborbital staging), but also to attain the 5,900 km circular orbit with two additional propulsion burns of the J-2X engine,” the presentation noted. “This would be done to quickly move the SPS payload through the main Van Allen belts, minimizing SPS power generation systems exposure to the radiation damage. At that point, the spent Earth Departure Stage is jettisoned, and the high performance transfer stage takes over the long duration, spiral delivery to the operational orbit at GEO. In spacecraft propulsion, a Hall thruster is a type of ion thruster in which the propellant is accelerated by an electric field. Hall thrusters trap electrons in a magnetic field and then use the electrons to ionize propellant, efficiently accelerating the ions to produce thrust, and neutralize the ions in the plume. 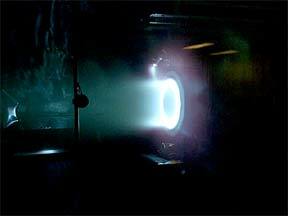 “Hall-effect thrusters offer high specific impulse (2,750 sec), but at low-thrust. Similar ion propulsion units are in routine use by modern commercial communications satellites, and can significantly improve payload performance to GEO compared to chemical propulsion,” added the presentation. “The tradeoff of low-thrust and high payload yield at GEO is the time needed to reach GEO. In this case, 180 days was assumed for the spiral out to GEO. The Hall effect thruster stage mass is 12.2 mt that includes 7.0 mt of Xenon propellants. Argon propellant is a less costly option, but has lower performance. The benefits of providing the means to launch the SPS demonstration may – it could be assumed – be of great interest to agencies outside of NASA, who could use the opportunity to provide funding of their own to part-cover the costs involved. “SPS demonstration system is based on solar dynamic power conversion and microwave beam transmission from space to ground. In this case the solar collector/concentrator and the solar dynamic power generation systems are sized to provide one megawatt of power to the transmitting antenna,” outlined the presentation. “A 53-m diameter transmission antenna is assumed operating at W-band frequency of 94 Ghz. This frequency was selected to reduce the system size both in space and on the ground. The ground based receiving rectenna size to collect all of this energy would be approximately 7 km in diameter, which is impractical for such a prototype demonstration. “The main goal of the demonstration mission, however, is to measure power densities within the intercepted beam and power conversion efficiencies throughout the system. This may be effectively done using a smaller, 150-m diameter rectenna, with the rectenna element arranged along the axes of the beam. Should the demonstration prove to be successful, follow-up missions could be launched via two extra HLV missions, carrying additional power generation modules to Geostationary orbit. “Following these initial tests, the demonstration SPS could be augmented by two additional HLV launches that would bring more solar dynamic power generation modules to GEO, boosting the total power generation of the SPS demonstrator to the 20 megawatt limit for the transmitting antenna. The benefit of the Shuttle-derived sidemount HLV comes via the backing of 132 ‘test’ flights of the Shuttle – given its huge amount of commonality – which helps realistically define the numbers presented in the SD HLV assessment. “The HLV Team chose to base its initial reliability estimates on the Probabilistic Risk Assessments (PRA) performed by S&MA PRA experts. As the HLV study progressed, these initial estimates were modified as assumptions changed, but still, the HLV reliability numbers for Shuttle-heritage hardware can be traced to the Shuttle PRA (Iteration 3.0),” noted the presentation. The report shows that the Loss of Vehicle (LOV) estimates range from 1/137 to 1/186 representing a range of low reliability to high reliability both with and without SSME benign shutdown. “The reliability of the in-line version of the HLV should be similar to that of the side mount. The SSME (Space Shuttle Main Engines) and SRB (Solid Rocket Booster) numbers should remain the same. The ET (External Tank) will undergo modifications that will impact reliability by a small amount. The loss of operational proficiency with the retirement of the Space Shuttle is an often overlooked risk. 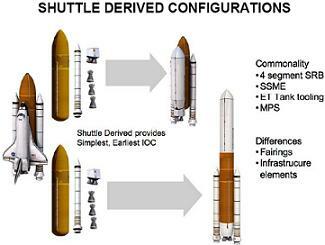 In this regard retaining a configuration as close to the Shuttle is critical. The extra two to three years difference between sidemount and inline operations shown in this report can – it is argued – erode this operational proficiency. 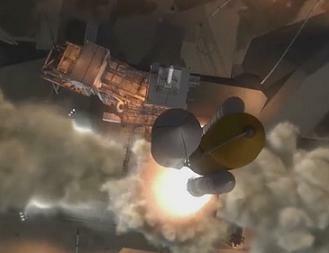 “Safe abort depends on a combination of Loss of Vehicle reliability and Launch Abort System reliability. HLV has a high confidence LOV number whereas new designs, as has been shown with many previous flight systems, would have to build, through many flights and infant mortality, the same level of confidence in LOV reliability estimates,” added the assessment. “Efforts since the Columbia accident have significantly reduced foam-shedding events from the External Tank with the most recent Shuttle flights being the cleanest in terms of foam shedding in Shuttle history. Any foam shed will follow longitudinal paths largely along the sidemount payload carrier surfaces with only glancing impacts possible. The study also showed that the plumes from the Orion LAS (Launch Abort System) will not cause a structural failure of the ET during an abort. The HLV study results continued by showing a safe water landing – which became the baseline early into the Constellation Program’s mission profile design – would be very similar to the Orion/Ares I configuration for the HLV. 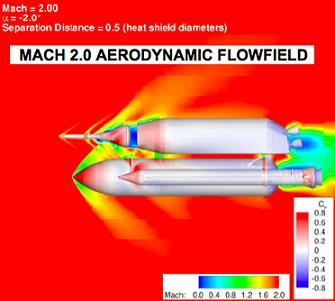 “Monte Carlo simulations for transonic abort were compared between the HLV/Orion and Ares I/Orion. Assuming a Mach 1 abort scenario, the lower dynamic pressure of the HLV/Orion results in a lower number of abort performance metric failures than the Ares I/Orion. In fact, HLV/Orion has about half the probability of a failed transonic abort than Ares I/Orion. “All launch vehicle approaches (whether in-line or sidemount) require approximately two seconds of warning time to initiate an abort and allow the crew module to proceed, under high g-levels, to a safe distance from the launch vehicle. The separation distance of the crew module from the launch vehicle intertank for inline vs. sidemount is a secondary effect amounting to an increase of warning time requirement of ~ 0.1 seconds. The study details the many factors in examining the issue of safe aborts from a launch vehicle. However, to focus on one of two factors alone does not provide a complete picture of a ‘safe abort’. The study details these factors when examining an abort from an Ares I and a sidemount HLV. The Loss of Crew estimates depend on the reliability of the Launch Abort System. 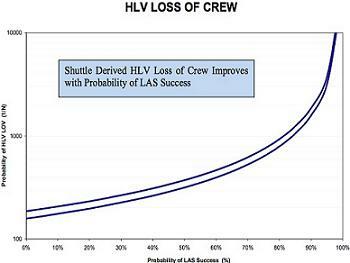 For an 85 percent LAS reliability, the HLV study shows the Loss of Crew probability reaches 1/1000. “The reliability estimates of all HLV systems are realistic and of high confidence because they are based the actual Shuttle hardware and systems that have been built and flown in the last 30 years. The HLV, thus, will immediately benefit from a large and impressive real-world experience base of Shuttle legacy systems, resulting in a more reliable and safer design,” added the findings.